There’s a certain combination of cold winds, early morning brain and astounding wilderness that cuts off one’s nose. Or more precisely, the ability to feel it. To lose all sensation in and of it. Where no amount of hand warming and woolen gloves help ‘un-numb’ it. For a cold weather rookie like me it can be fairly disconcerting, more so in the thin air at 4,278 meters. But for these views, an absconding nose seemed like a throwaway price to pay. Clambering closer to those dream-like views, hoping not to wake up if it was indeed a dream, our eyes gobbled up the views on every side. The missing noses could wait. You are what you eat. The flamingos must have worked that out by now. 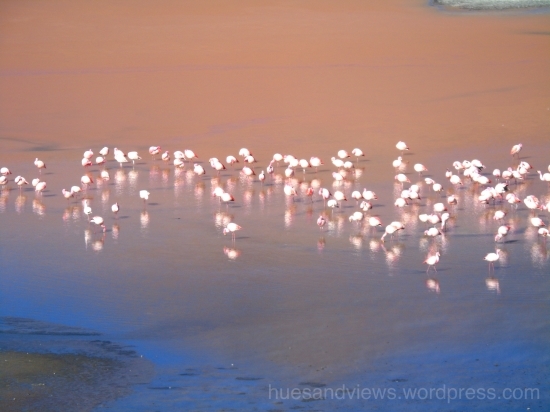 Born grey, they get their pink hue from the red algae that paint the lagoon red. 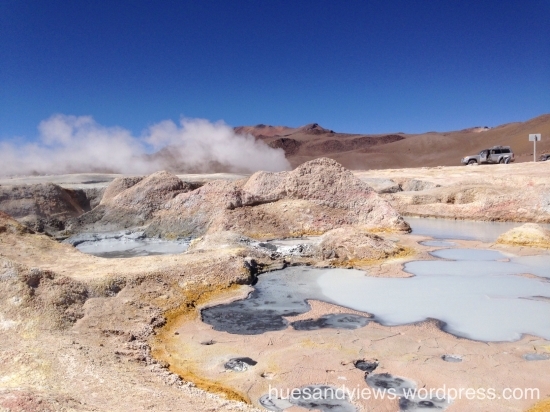 From the sublime Laguna Colorada to the furious fumaroles and bubbling cauldrons of Sol de Mañana, the highest geothermal sulphur spring field in the world at 4,890 meters. 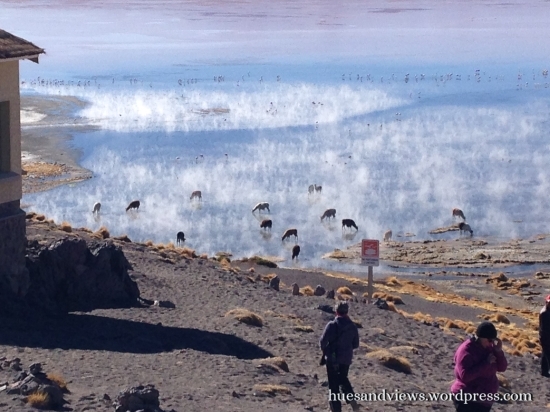 Intense volcanic activity brewed underground while chilly winds lashed under a hot sun. Nature can be quite the drama queen and a stunning one at that. 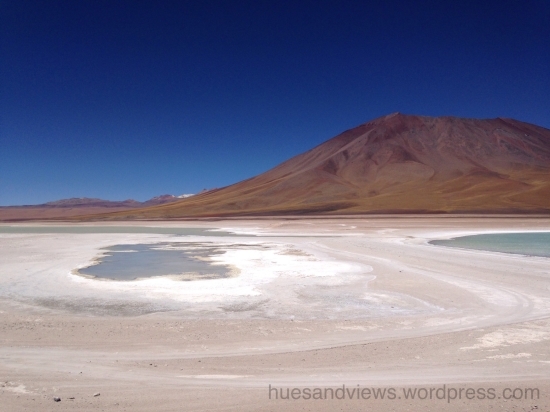 Though Spanish for ‘green lake’, Laguna Verde doesn’t always wear the same colour. 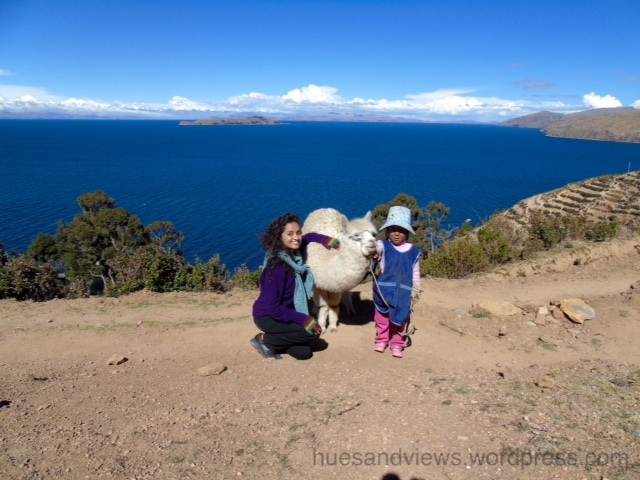 Lucky for us that afternoon, the sun and the icy winds had conspired up this stunning turquoise hue that made blinking seem like a terrible idea. If the winds hadn’t whipped up this cocktail of lead, sulphur, arsenic, calcium carbonates and god-knows-what-else under that sun, we’d be looking at a Laguna Murky Brown instead. Easily the most inviting water body I’ve ever met, but also the most toxic – holding enough arsenic to make it the only lagoon there without any flamingoes. Behind it, the perfectly conical Licancábur volcano stood 5920 meters tall, dark and certainly handsome, fully intending to steal the show and our hearts. Astronauts have trained at its summit for missions to Mars, diving into its caldera lakes as they provide an environment strikingly similar to the red planet. ‘Otherworldly’ seems an apt description for a place where planetary scientists and astronauts go to train for missions to Mars. The Germans have a word – Diewaldensamkeit – to describe the feeling you have when you’re alone in the wild, of experiencing nothing but the world around you. 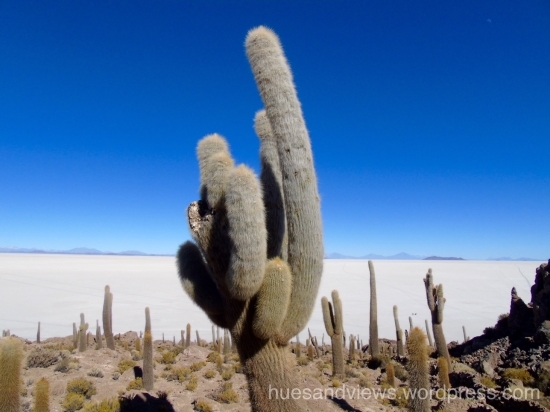 After the Salar de Uyuni, I suspect the Bolivians have a word for the feeling that fills you when you experience nothing but all the nothingness around you. Thanks to prehistoric lakes that vaporized, thoughtfully leaving a zillion hexagons of crystallized salt and nothingness in their wake. 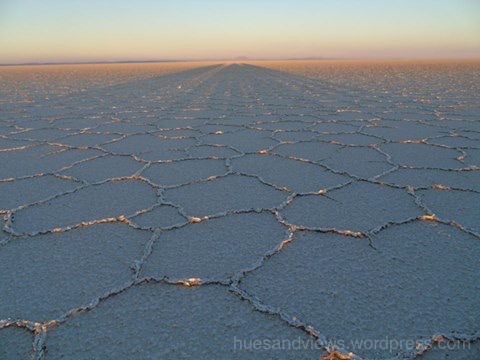 After hours of those horizon-filling hexagons, we had to wonder why the cracks are all that shape. 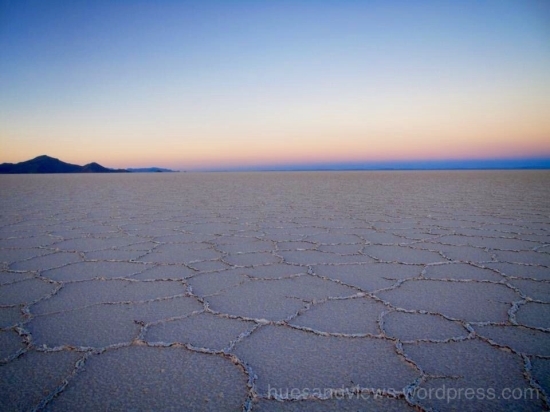 This is what google told me after much coaxing – As the alkali crust of the salt flats cracks, the cracks meet to form relatively regular, hexagonal shapes. The cracks meet at intersecting angles of roughly 120º, forming a honeycomb-like structure. This uncanny structure likely results from simple geometric efficiency. The 120º angle minimizes the surface area for a given enclosed volume, rendering the quasi-hexagonal shapes the most energy efficient formation for a given space. The same reason that honeycombs constructed by bees also take on tessellated hexagonal structure – Wow. Take a 120º bow, whoever cracked that! 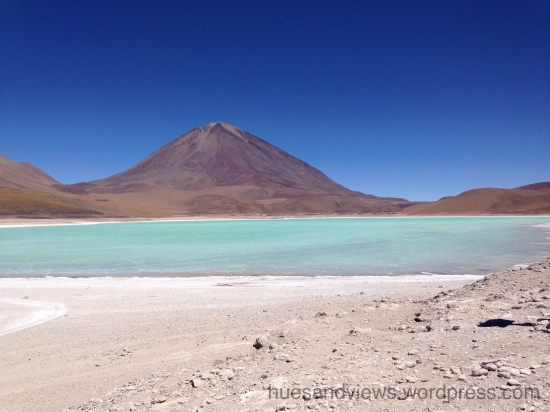 Ever wondered what the top of a volcano would look like centuries after getting drowned by lakes that are now salt deserts? Me neither. 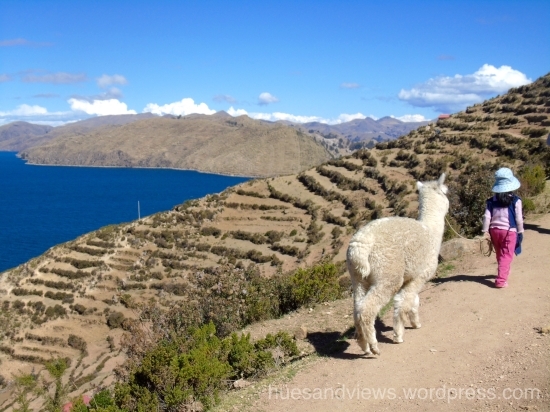 Meet Isla Incahuasi, Quechua for island of the Inca house. Massive centuries-old cacti hoping to poke the sky someday and fossilized coral evidencing ancient sea life populate this slice of bizarreness on the salt flats. 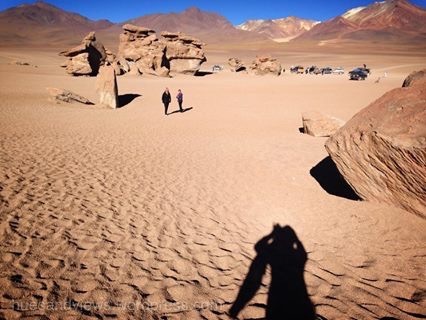 Chilly winds sprinting through the Siloli desert at 120 km/h leave no stone unsculpted, and a lot can happen over sand, wind and rock. 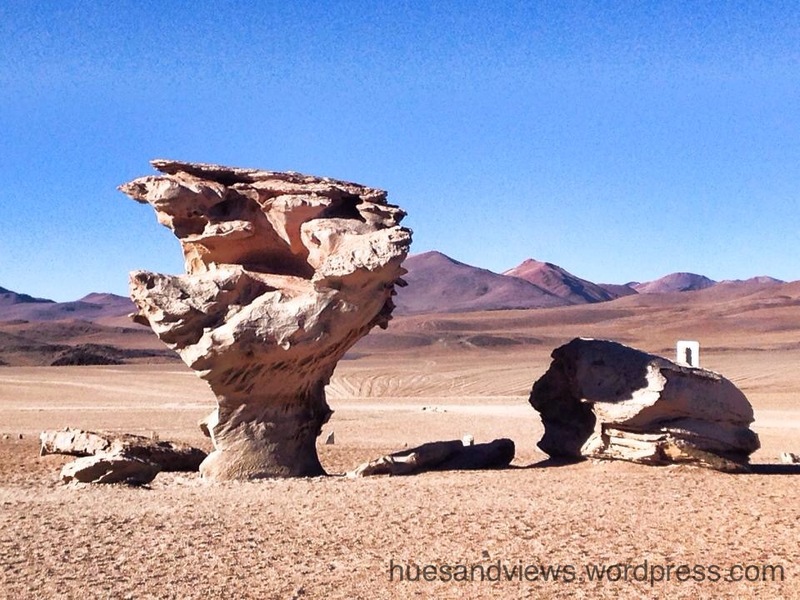 Ask the Arbol de Piedra (Stone Tree), one stunning testament to the elan of the elements. 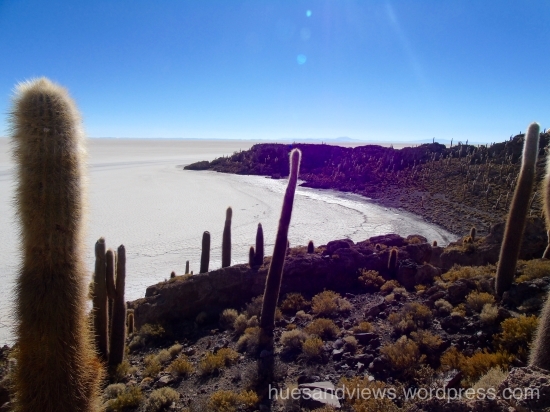 In a tip of the hat to the surrealist painter Salvador Dali, the place is also known as Desierto de Dali. ‘Highest’ is a word you hear often in this part of the world. 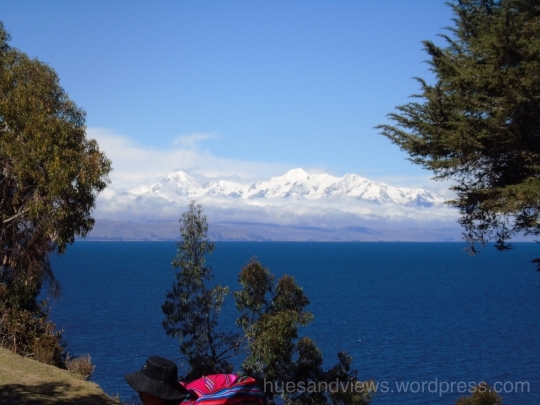 Said to be the highest navigable lake in the world at 3800m, Lake Titicaca is also the largest lake in South America. And home to the richest blue. Like a giant sapphire that melted across 8372 sq km and 281 meters below, one half crossing into Peru. Legend has it that the sun, the moon, the stars and humankind were all born here, giving it the epithet ‘womb of the world’. ‘All good things are wild and free’ said Henry David Thoreau about a century and a half ago. 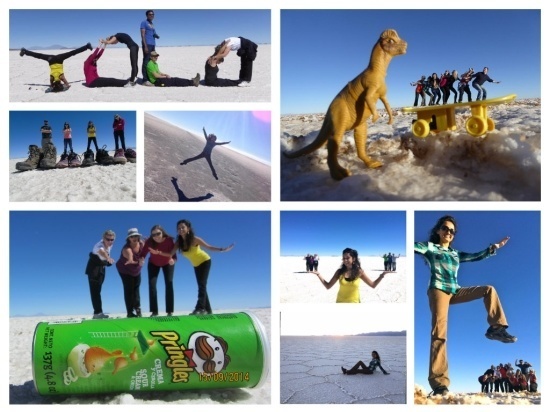 Moving through Bolivia’s unending vastness and wildness – from the surreal drive across 4000 sq. 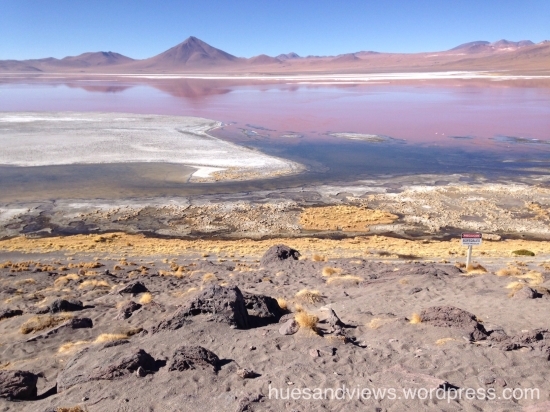 miles of salt flats, colourful mountains, deserts slashed by chilly winds, geysers fuming away like they had so much to vent and nobody to listen, statue-still flamingoes asleep on frozen lagunas – all of this and more held up a mirror to much that is vast, wild and free in me. Knocking persistently on those innate reserves of vastness and wildness one stashes away for future use, as if to ask, as my guide’s G Adventure T-shirt did – If not now, when? A question that takes nothing less than another new journey for an answer.